The Bagan Thiripyitsaya Sanctuary Resort gives highest priority to rendering the most memorable Bagan visit for our Guests. With extensive research and planning, Thiripyitsaya has set up several activities that will give one a taste of the best that Bagan with its special environment has to offer. The Tour Desk at the Reception will be able to recommend and guide interested individuals and groups as to how they can experience and enjoy the real Bagan in the Resort compound and around the Bagan plains. The Tour Desk can assist with arrangements for the following tours designed to give one the opportunity to explore Bagan’s glorious past. Send an email to thiri@myanmar.com.mm for more details. A stroll around the bustling Nyaung Oo morning market, the focal point of local commerce, is followed by a tour of Bagan’s most noted pagodas of varied styles. The pagodas will make one understand the grandeur and influence of the ancient Bagan kingdom, as well as the strong presence of Buddhism in the people’s daily lives to this day. After lunch and a short rest at the Resort, a visit is arranged to the Myinkabar Primary School, with its large student body of smiling, happy children. The tour finale is a climb up the Shwe Sandaw Pagoda at late afternoon to witness the spectacular gold-rose sunset in the horizon over the Bagan plains. Please visit the Tour Desk for assistance. 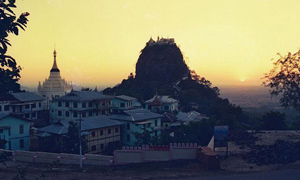 A visit to the Nyaung Oo morning market is followed by a 90-minute drive to Mount Popa, Myanmar’s equivalent of Mount Olympus. It is said to be the traditional home of Myanmar’s most powerful Nats or Spirits. Along the scenic route, a stop is made to watch villagers climb palm trees to collect palm juice, which is later used to make jaggery or brown sugar. Just Before arriving at Mount Popa, a hike up more than 700 steps to the summit of the pedestal hill Taung Kalak is undertaken to reach the hilltop monastery and enjoy breathtaking views. After all that physical exertion, a leisurely lunch at the Popa Mountain Resort ensues before going back to Thiripyitsaya.